The national park authority has cleared snow from the car park at one of Snowdonia’s busiest starting points for walkers and climbers. 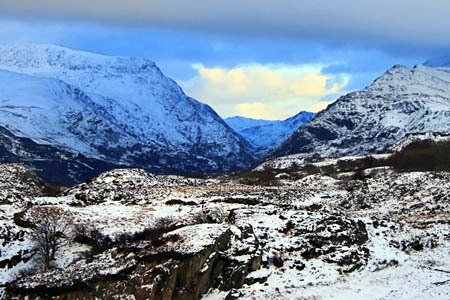 The blocked parking area at Pen y Pass had created congestion and obstruction problems as mountaineers flocked to the area to enjoy the rare winter conditions. The inaccessible car park had prompted calls to use public transport which, in its turn, created safety problems, according to the British Mountaineering Council. The BMC said the Snowdonia National Park Authority’s policy was not to clear areas such as the Pen y Pass car park, starting point for many ascents of Snowdon and base for many winter climbing routes in the Pass of Llanberis. The park authority was urged by the BMC to rethink its practice of not clearing snow from car parks if further snow is forecast, as they see this as a burden on resources. Buses and other traffic were having difficulties negotiating the road at Pen y Pass, which had effectively been made single track by cars parked on the highway. Similar problems were being experienced in the Ogwen Valley, base for Tryfan, the Glyderau and the Carneddau. Both the A5 through the Ogwen Valley and the road through the Pass of Llanberis are clearways, with stopping banned. But the car park at Pen y Pass has now been cleared by an excavator, though it is likely to remain very busy as mountaineers enjoy further arctic conditions. For those who do make it out of the Snowdonia car parks, there was a warning that the risk of avalanche remained high. Last weekend a woman was caught in an avalanche on the Pyg Track, one of the most popular routes up Snowdon, and was carried 90m (300ft) down the mountainside. “She was very lucky to be able to walk out uninjured,” he said. The blocked parking area at Pen y Pass had created congestion and obstruction problems as mountaineers flocked to the area to enjoy the rare winter conditions. The blocked car park had prompted calls to use public transport which, in its turn, created safety problems, according to the British Mountaineering Council.